On Monday we had the pleasure of hosting our 14th Supplier Summit. This annual event provides an opportunity to thank our suppliers for the role they play in allowing IWCO Direct to maintain our leadership position in the direct marketing industry, as well as updating our business partners on the state of IWCO Direct from both a financial and operations perspective. 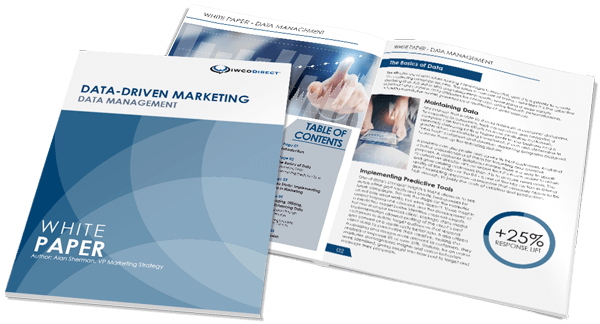 We also provide an overview of how our sales and marketing strategies are positioned to take advantage of evolving trends in the direct marketing industry. We wanted to recap the highlights of what was a very successful event, including presentations from Debora Haskel, Mike Ertel, Joe Morrison and myself. Debora shared a look at the top marketing trends in 2014. These trends show direct mail continues to be one of most viable marketing channels available. Consumers appreciate direct mail’s tangibility, flexibility and once-a-day frequency. Marketers continue to count on direct mail as their primary method for customer solicitation, delivering the right message, to the right person, at the right time. Studies show more households read advertising mail now than they did 25 years ago, with 79% of consumers acting on direct mail immediately compared to only 45% who say they deal with email immediately. Recent marketing trends have demonstrated that an integrated approach including analytics, testing and reporting is key to successful direct marketing campaigns. For this reason, our “Total Package” approach is evolving beyond just execution to encompass data, strategy, creative and analysis as well. Mike shared a case study showing how we helped a healthcare client achieve a 53% increase in response rate, reduced production and postage costs, and more tightly targeted in-home windows using our Proprietary Intelligence Model. As part of his financial review, Joe explained how IWCO Direct’s customer base has become more diversified, expanding into sectors such as MSO/subscription services, retail loyalty programs, and healthcare. He also highlighted how we have been making substantial capital investments to transform our business to become the industry leader in continuous inkjet digital. Digital print technology enables more customized messaging and lowers postage costs, driving faster speed to market and increased return on marketing investment (ROMI) for our clients. Our digital platform, combined with our Proprietary Intelligence approach to Marketing Services, is a powerful marketing tool that is transforming how marketers use direct mail. Joe reminded the audience about the production capabilities we’ve added over the past year in addition to the expansion of our digital platform. These include our first Inveloper® Wrap-Based Finishing System, an expansion of our DOD card personalization capabilities, and 4-color imaging on outer envelopes. We look forward to continuing to collaborate with our supplier partners to develop new products and formats to better serve our customers and to install the capital infrastructure that will allow us to produce these new products and formats efficiently and expediently. With the help of our supplier partners, IWCO Direct is the leading, fully integrated provider of direct mail solutions to direct marketers and loyalty programs in the U.S. We are in an industry with healthy fundamentals: direct mail is the largest segment of the $93 billion direct marketing industry, overall direct marketing spend has remained constant over the past five years at about 35%, and direct mail industry spend is projected to remain stable for the foreseeable future. Developing innovative new formats and products. The future looks bright, but we challenged our suppliers to continue identifying competitive advantages, striving for flawless execution every day, and focusing on innovation in their products, processes, technology and services. With our suppliers help, we’ve been able to transform our business model to make IWCO Direct a strategic partner for our customers with a seat at the coveted marketing strategy table. Once again, thank you to everyone who made it to our 14th Supplier Summit. I’d also like to thank everyone at IWCO Direct who made this year’s Supplier Summit possible. There were so many people behind the scenes who contributed in countless ways. They cannot be thanked enough for their effort in pulling off such a great event.